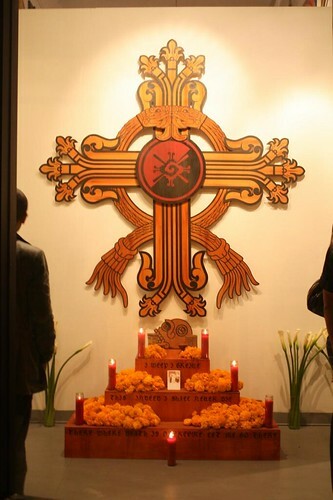 The cross created by the ancient Mesoamerican glyphs for fire and water is actually an axis mundi representing the four cardinal points. In Mesoamerica there was also an understanding of the importance of including a center point represented here by the symbol of Ometeotl. All of the indigenous cultures of what is now the Americas would situate there cities to these points. The axis mundi was used to represent life weather external or internal, physical and spiritual thus becoming a representation of the Universe. To the Mexica there were nine levels in the underworld the furthest being Mictlan. 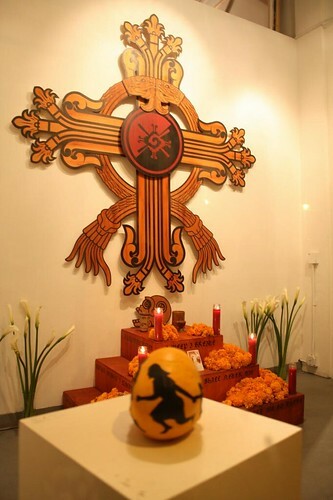 It is in Mictlan that Quetzalcoatl descended to recover the bones of ancestors and reestablish human kind in the fifth sun. The lower portion of the axis mundi represents its reach into these levels with the skull at the bottom to represent our ancestors. 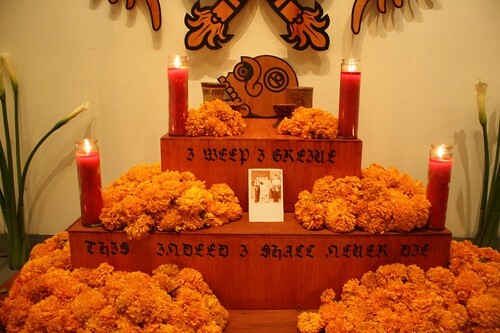 The poem surrounding the three tiered alter is by Nezahualcoyotl. Indeed I shall never disappear. The seven candles represent my immediate family. 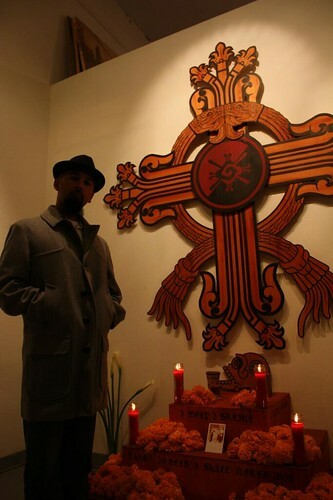 To tie the piece into current issues I wrapped the two symbols of Quetzalcoatl forming a sort of caduceus often used to represent medicine and physicians. I wanted to create a symbol that represented indigenous philosophies and was almost a mirror of western iconic symbols that was in every sense a mirror image. That is to say the opposite of what it's counter parts are. In this era of "healthcare reform" I think it is important to present alternatives to corporate healthcare and rediscover what has been taken from us, the fact that we can heal ourselves and have done so since the beginning of time. At the point of the first encounter with Europeans the vast cultures of Mesoamerica had already documented over three thousand plants for medicinal uses. The photo is of my grandfather who is on the left. We were told he passed away from cancer but after an independent autopsy was performed it turned out that he had passed away from complications of a bad blood transfusion. The four vases holding calla lilies represent my grandparents. My maternal grandparents who lived in the United States passed away at a relatively early age while my paternal grandparents in Mexico both passed away in there 90's. *Oscar's beautiful installation can be viewed at Crewest throughout the month during our Top of the Dome VI exhibition. 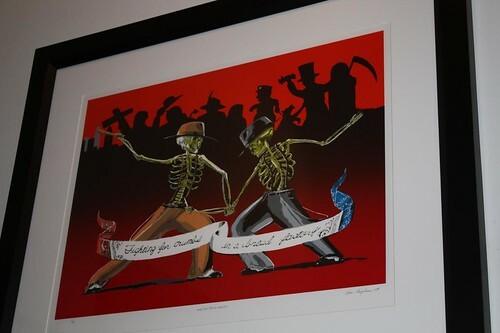 "and the Boss Laughs" - on archival paper, created at Self Help Graphics, 2009.